Halve the eggplants lengthwise and cut the tops off of the garlic bulbs to expose the cloves. Brush the eggplant flesh liberally with EVOO and douse the garlic with EVOO as well; season both liberally with salt and pepper. Strip the leaves of rosemary from the stems and arrange them on top of the garlic. Wrap in foil and place in the oven to roast with the eggplant. Place the eggplant face-down on a baking sheet. Roast for 40-45 minutes, then let cool. 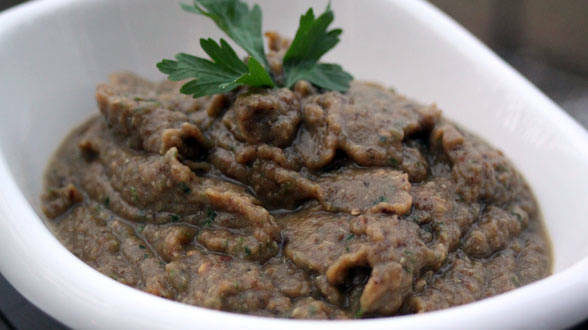 Scoop the eggplant flesh into a food processor bowl. Squish one garlic bulb to loosen the cloves away from skin and add them to the eggplant, along with the rosemary. Add the parsley and pulse to combine. Transfer to a serving dish and serve at room temperature with charred or toasted bread. Reserve the remaining roasted garlic bulb and rosemary for making the White Bean and Sesame Spread, or freeze for another later use. In Recipes-list.com we have selected the most viewed recipes from category - uncategorized . Enjoy the best recipes specially selected for you! Crostini Bar: Smoky Eggplant and Roasted Garlic Spread is the right choice that will satisfy all your claims.